In the San Francisco Bay Area the Sunday storm ranked as an 8.5 on the Bay Area Storm Index (BASI). This was based on a 24-hour downtown San Francisco rainfall total of 1.62", a maximum sustained wind at SFO of 44 mph and a peak (below 1500' elevation) wind gust of 75 mph at Spring Valley in San Mateo County above Crystal Springs. This is the highest ranked storm since October 2009 (see archive). Despite a couple colder than normal periods, only Eureka and Sacramento had monthly average minima of more than 2 degrees below normal. 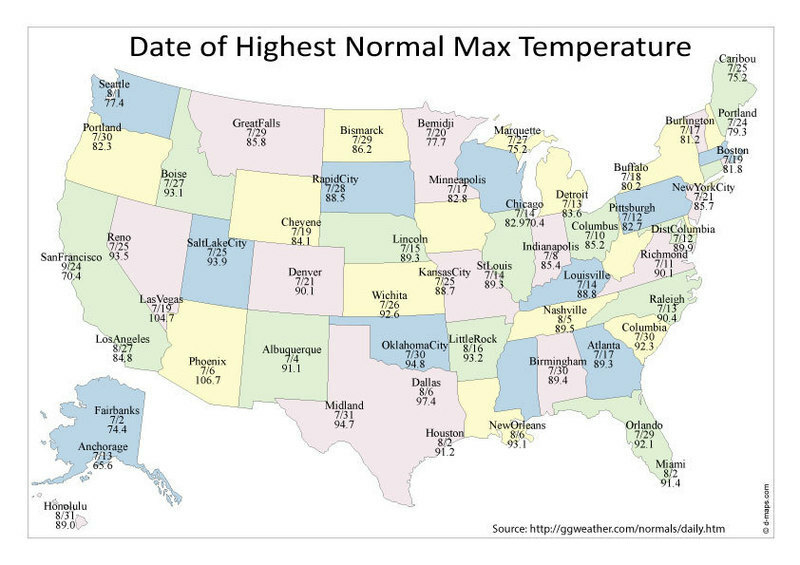 At the same time, LA and San Diego average monthly minima were more than 2 degrees above normal. See also http://ggweather.com/seasonal_rain.htm which is updated daily, in the early evening. With the potential for extensive rains in the next 10 days, I have updated the Rainfall, River and QPF Page . 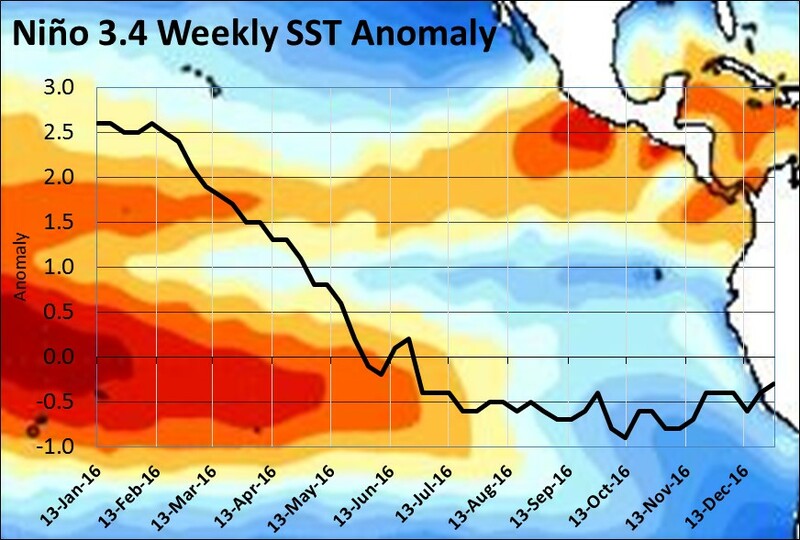 La Niña's cooling in the tropical eastern Pacific may have bottomed and the weekly Sea Surface Temperature Anomalies (SSTAs) for the past month have averaged just -0.4. Finally, I am headed for the 97th AMS Annual Meeting in Seattle later this month to present a paper of Heatstroke Deaths of Children in Vehicles. If you are also going to be in attendance, drop me an email and we can try to connect. Today, December 1st, begins meteorological winter; the three coldest months in the Northern Hemisphere. 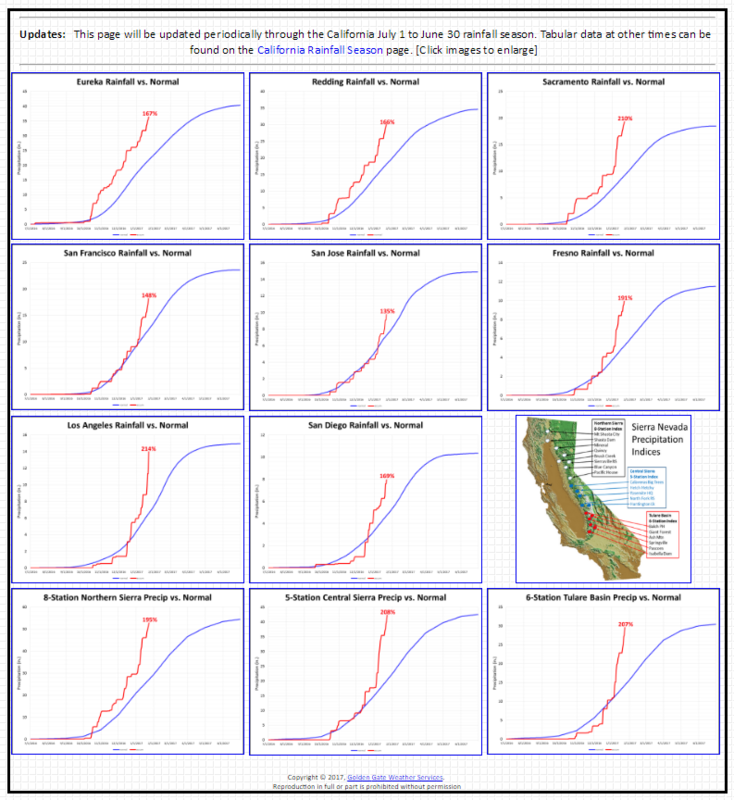 And for most locations in California it corresponds to the three wettest months. 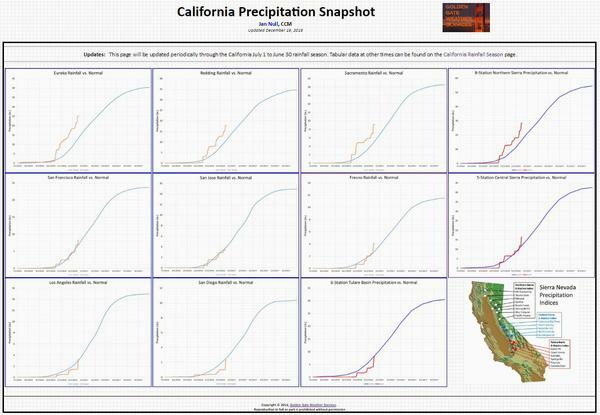 After a much wetter than normal October (http://ggweather.com/calif/oct2016.htm) for Northern and Central California the November totals (http://ggweather.com/calif/nov2016.htm) were more of mixed bag, but still concentrated in the north. 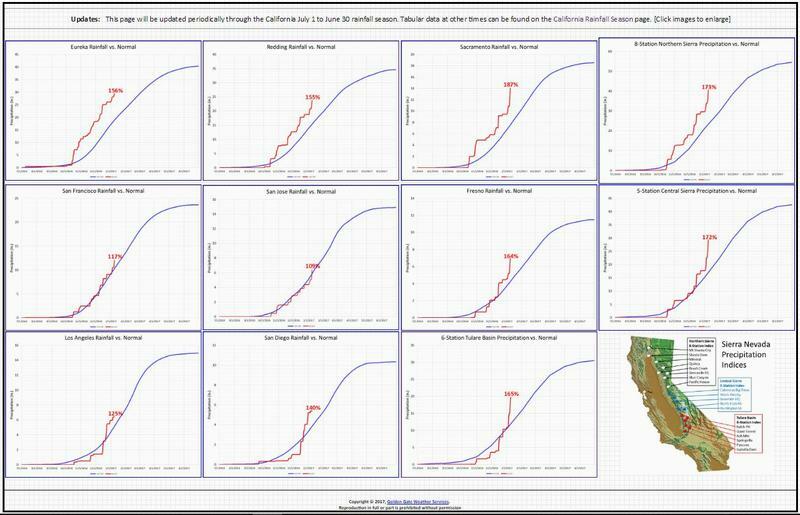 Consequently the totals for the first five months of the rainfall season (July 1 to November 30) have the northern half of California above normal (http://ggweather.com/seasonal_rain.htm). Given the rainfall bias in the north the Drought Monitor is showing relief there but still 43% of Calif in Extreme or Exceptional Drought. A Different Flavor of La Niña? 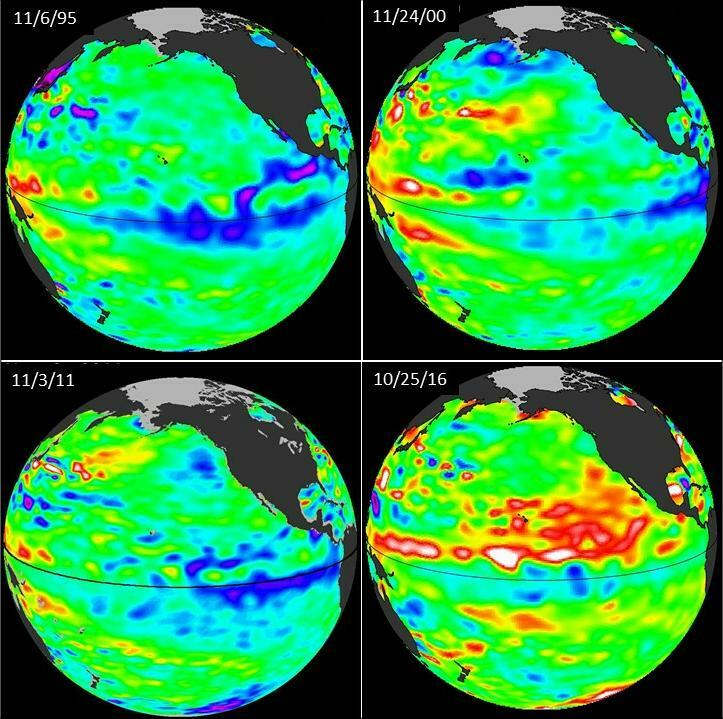 Unlike those picture puzzles where you are asked to find subtle differences between images, a look at the NASA sea surface height anomaly images for the past three weak La Niñas (1995, 2000, 2011) plus this year (2016), leaves little doubt that what's going on in the eastern Pacific is not subtle at all. The most striking difference is the anomalous warm water from the equator north to about 25 degrees north. This area warmed in conjunction with last year's very strong El Niño and may have contributed to the atypical winter along the west Coast of North America (see "Differences Between 2015-16 El Niño and Previous Strong and Very Strong Events"). With the current Oceanic Niño Index (ONI) already at weak La Niña levels, tomorrow's updated CPC ENSO Advisory is likely to up the odds for a La Niña this fall and winter. But can we still use the standard "La Niña playbook" of looking at past events as an indicator of broad-scale for West Coast precipitation patterns for this winter? 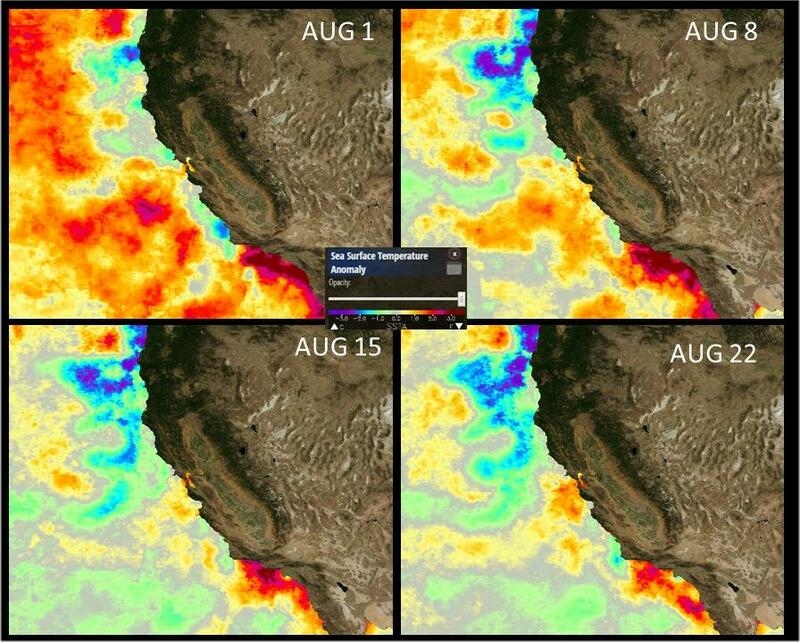 Last winter the conventional wisdom for the impacts of a very strong El Niño did not work out per previous events. Consequently, it looks like extreme caution should be exercised in looking for patterns based upon the climatological past related to the prospects for current La Niña. October Rain Only "A Good Start"
October 2016 was a wet month in the northern two-thirds of the state but the south continued to be pretty dry. 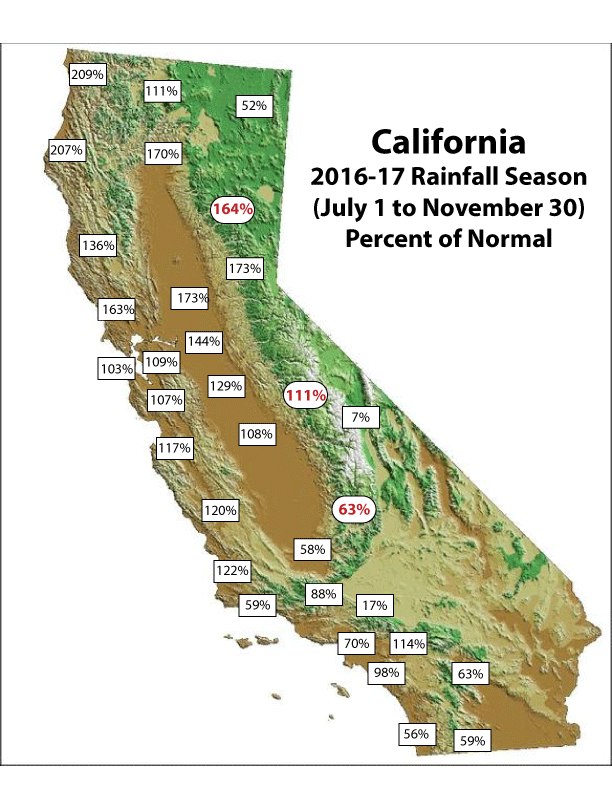 (See: summary) Monthly rainfall ranged from over 450% of normal at Eureka and Sacramento, while Los Angeles and San Diego only had 79% and 12% of their normal October rain respectively. 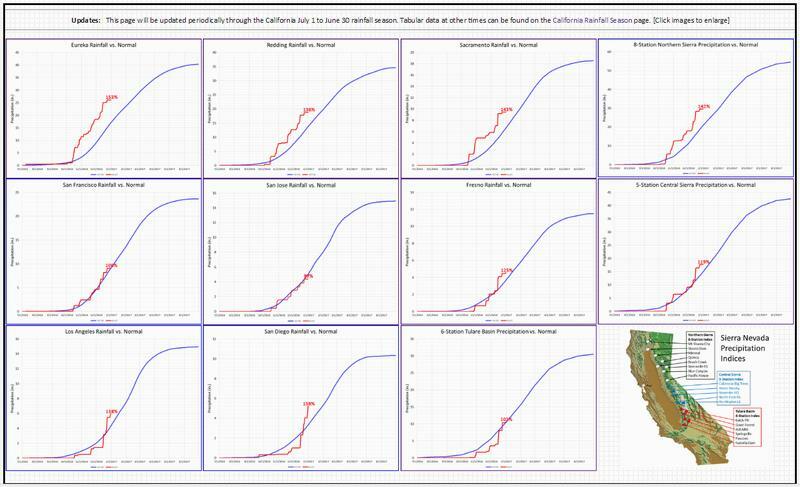 But these numbers need to be put into context as October normals are relatively small and there is not a statistically significant relationship between October rainfall and how the rest of the rainfall season (July 1 to June 30) ultimately ends up. San Francisco’s 2.43 inches for the month is 217% of normal (1.12”), but this ranks as only the 23rd wettest October going back to 1849. The wettest was 7.28” in 1889 (below). One factor affecting the perception of it being a very rainy month were the number of days of rain. This year there were 12 days of measurable rain in San Francisco, the second highest number on record. The most was 13 days in that very wet October of 1889. Looking at the 25 wettest Octobers (below) there is not a correlation to how the seasons ultimately ended up; other than being a “good start” by saturating the soil to enhance future runoff and significantly reducing the fire danger. 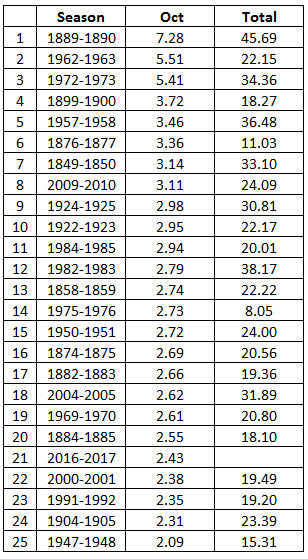 Eleven of those 25 wettest Octobers actually ended up below the 168-year average of 21.57”. This including the 2nd driest season on record; 1975-1976 when the season ended with a paltry 8.05”. When is the Hottest Day of the Year? 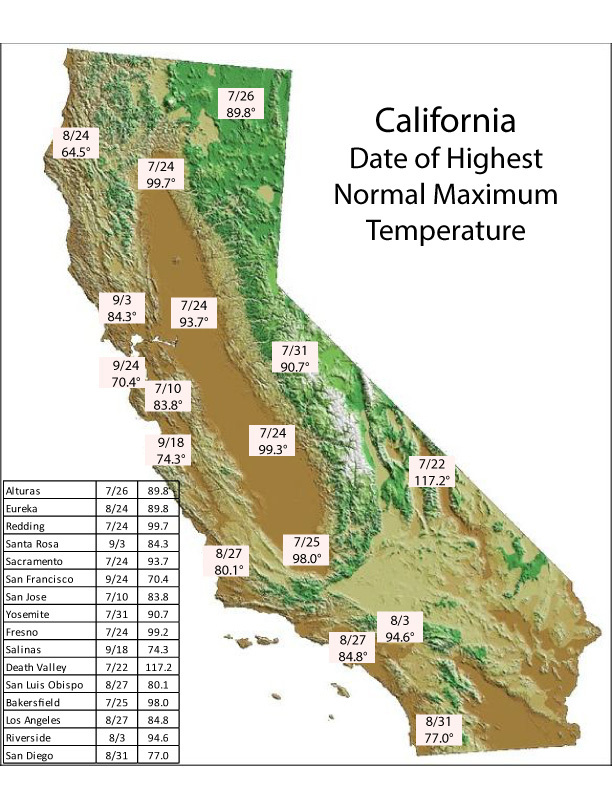 As we head toward the Autumnal Equinox (Sept. 22 @ 7:21 am pdt) most cities around California and the nation are well past their normal hottest day of the year, which typically occurs about a month after the Summer Solstice. But a few locations, especially along the West Coast, wait until August and even September to peak. And San Francisco is certainly the latest of any major United States city by not reaching its normal highest maximum temperature of 70.4 until September 24th. 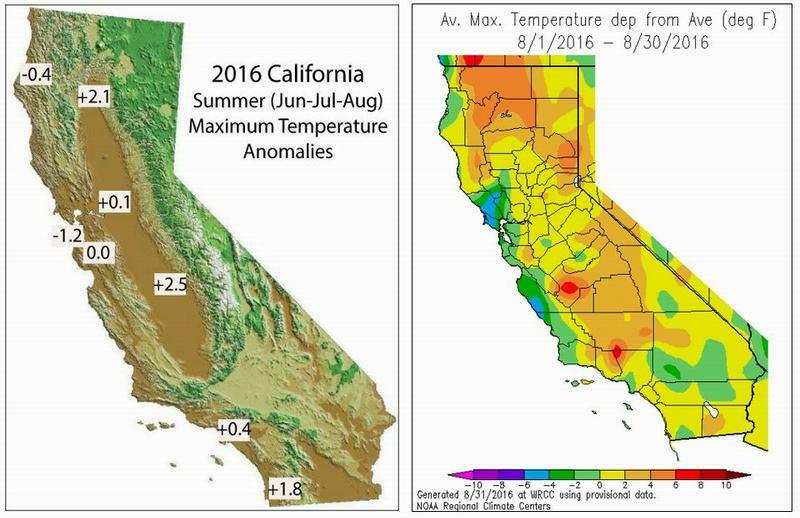 Overall the summer of 2016 was a real mixed bag in regards to California temperatures. The average maximum temperatures anomalies for meteorological summer (i.e., Jun-Jul-Aug) ranged from below normal near the coast from about San Francisco north to above normal over most of the remainder of the state. 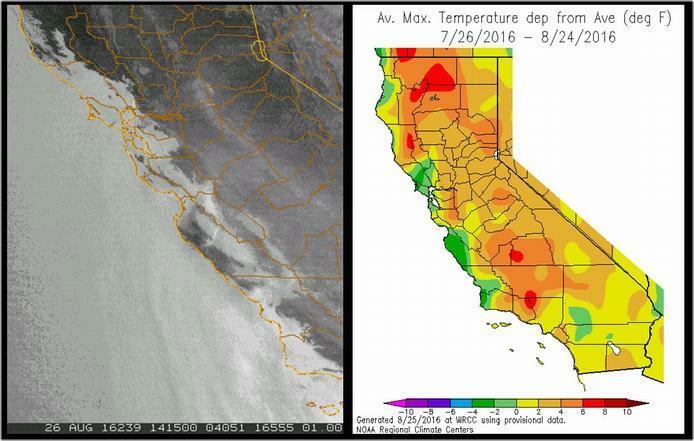 (http://ggweather.com/calif/summer2016.htm). 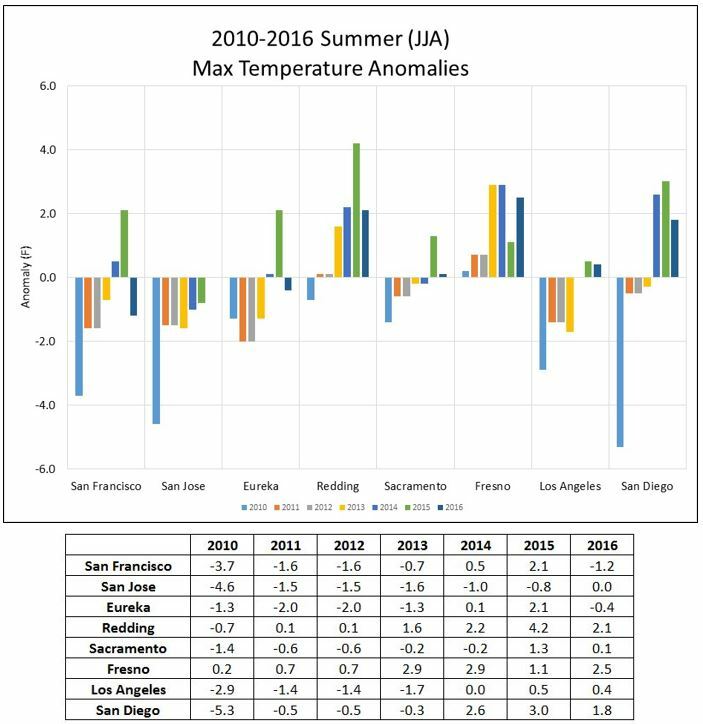 It should be noted that in San Jose the average summer temperature was right on "normal" with an anomaly of zero! Temperature records in San Francisco began in 1874 and this August will tie as only the 4th time that there was not a daily maximum temperature all month that did not exceed 70 degrees. In 1942 the highest reading for the month was only 67 degrees, while in 1917 and 1882 the highest was 69. On August 8, 2016 the maximum was just 70 degrees, tying it with 1881. So far in August 2016 the average maximum temperature has been 64.6, and given forecast maxima of around 64 degrees for the remainder of the month this will change little. The normal August high temperature in San Francisco is 68.1. But even with prolonged coolness, the average for the month will only rank as about the 35th coolest on record. The major player in the mild weather has been a persistent weak trough of low pressure over the West Coast for most of the month and a likewise persistent marine layer. It should be noted that the sea surface temperatures along the coast west of San Francisco remained above normal for the entire month. The story is different farther inland and away from the cool coastal air with August monthly maximums generally above normal. Finally I would be remiss if I did not point out that Mark Twain NEVER SAID "the coldest winter I ever spent was summer in San Francicsco". (per http://www.marktwainproject.org/). But if he had, it would likely have been a year like 2016.